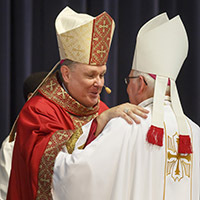 Archbishop of Brisbane, Mark Coleridge, was the principal consecrator of the ceremony. The co-consecrators were Archbishop Adolfo Tito Yllana, Apostolic Nuncio to Australia and James Foley, Bishop of Cairns, in the presence of Cardinal John Ribat MSC, Archbishop of Port Moresby, Fr Mick Lowcock who has been Diocesan Administrator since the death from cancer of Bishop Michael Putney three years ago. They were joined by priests of the Diocese of Townsville and clergy from the Archdiocese of Brisbane and visiting priests. Local Aboriginal representatives performed the traditional smoking ceremony across the congregation carrying lit bark and branches. 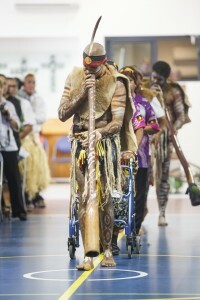 The didgeridoo was played during the smoking ceremony calling people together. Representatives from the North, South, East and West of the Diocese delivered a welcome to country. 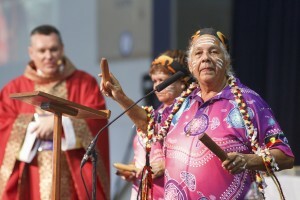 Fr Lowcock gave a welcome address at the beginning of the ceremony acknowledging the presence of the Bishops of Australia, in particular, Emeritus Archbishop Leonard Faulkner, ordained the third Bishop of Townsville in 1967 and 50 years a bishop later this year. The coat of arms adopted by Bishop Harris focus on the spikenard charge from the arms of Pope Francis who appointed the Bishop. For his motto, Bishop Harris chose, Grace and Mercy, which he intends to be a feature of his episcopate. Speaking at the ceremony, the new Bishop of Townsville said that he was now making another ‘leap of faith after nearly 25 years as a priest’. He said, ‘these years have been packed full and today I pray that the grace that comes in the fullness of this priesthood as a bishop will bear fruit in this part of the world, within the Roman Catholic Diocese of Townsville’. ‘I continue to say “yes” to God, not for myself but for you the people of God,’ he added. The 54-year-old bishop told the people of the Diocese, ‘I can only teach what the Church teaches and I believe in that teaching, but if any of you fail to live up to that teaching, I won’t abandon you. I will do what I can to accompany you, something I would hope every single Priest of this diocese is already doing in their ministry’. ‘Our Church needs to be known not for its pre-determined sanctions and judgements, but how it walks gently and compassionately with the sinner in order to heal the sin,’ he added. ‘I don’t underestimate the task that is before me. I am a realist. I know our Catholic Church is itself undergoing a cleansing and as that cleansing is taking place we must allow the grace of the Holy Spirit to empower us for service by putting past wrongs right, by visiting the field hospital, the image of the Church coined by Pope Francis and even admitting ourselves as a patient in that hospital so that healing will come to all of us. In that hospital, everyone is booked in. You will find the Pope there, the Cardinals there, the Bishops, the Priests and the people being tended to by the greatest specialist of our time and all time – the greatest healer who never stops work even if we do. He is Jesus Christ the Lord. Yes it takes courage today to walk into the field hospital, that Church for fear that someone will judge you or tell you that you are not welcome. Our communities and parishes have got to make a concerted effort to engage those Catholics who have become disillusioned for whatever reason by telling them that the Church is “open for business”. This engagement will demand that we get mud on our shoes by doing, and not just talking,’ Bishop Harris concluded. The Diocese of Townsville was established in 1930 covering an area of 434,400 square kilometres, extending from Townsville on the coast, to the Whitsunday and Burdekin regions in the south and north to Ingham.